Here's where we build on what we made yesterday. I have added yesterday's photo as a reminder, but you will need to go back and review those steps as indicated. Please excuse my dry cracked hands and fingers, hazards of working with wire. I was going to put some hand cream on but it is hard to work with wire when your hands are slippery. This is what we will be making today. 1. Twist wires on top of ring and curl them flush against themself (this is kind of hard to explain so I would refer to the sample picture. 2. Knot on top of ring should be in a more upright position vs. flat against the ring like in the love knot. 3. Gather additional supplies such as various beads (I use predominately 4-6mm) and head pins. Good way to use up some beads that get separated from your others as you can mix and match if you want. I keep a little jar to throw my extras in when I'm finished with a design. 4. Make sure your beads will fit your head pins (the pearls I had laid out didn’t work so I had to use other ones). 5. String your beads on the head pin start to make a wrapped loop. 8. 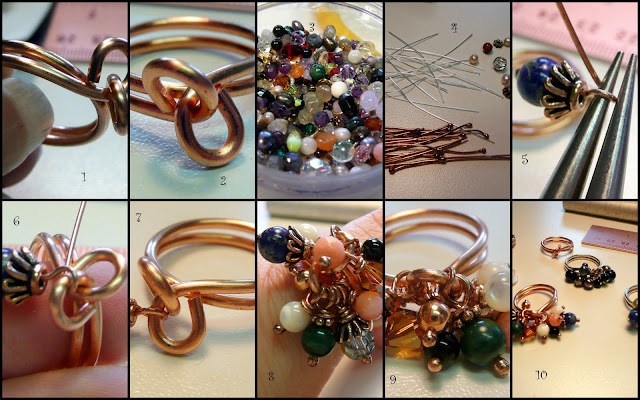 Continue making wrapped loops on your beads and adding them to your ring alternating the sides. I hope you have enjoyed this tutorial series. I would love to hear your comments and see pictures if you have made any of these rings. Not that I have time to do it right now but I love the look of the simple knot ring and it would go perfect with my other Love Knot designs. Okay Megan, you have twisted my arm. You can make and sell them. These are so easy. The simple knot ring takes probably a total of 10 minutes or less depending upon how much polishing you have to do so you should have time to make a few. Ann if you really want one, I'll have some for sale in my ArtFire studio soon. Hi Dana, Great tute again! I will link in a future blog post!! This is gorgeous! I would love to try to make one! I'm very crafty, but for some reason I'm horrible with jewelry tools. Any tips for a beginner? Hi, your photos are great. very neat and clear. Does anyone know what kind and size of wire is being used to make this ring? Thanks for your comment and it would be confusing if you didn't see the Part 1. 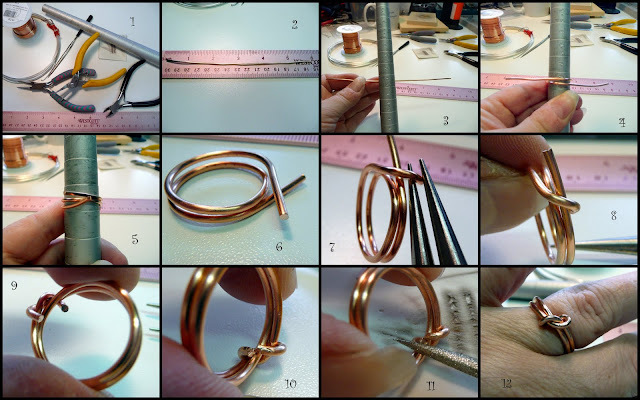 Here is the link http://danasjewelrydesign.blogspot.com/2010/02/love-knot-ring-tutorial-part-1.html that explains how to make the base of the ring. I used copper wire that was 14 gauge. This is a fun ring. Hope you try it out. Hi, if you just want the love knot ring then leave the ends tucked under (tutorial 1). If you want the loop ring you tuck them on the top. Two different rings but made very similar. The caps were for a size 6mm bead and there are some spacers in there also.